I’ve touched on aspects of this topic before, but thought it was worthy of a full post. Companies in the venture business fail all the time. As I wrote last year, the majority of venture rounds fail to return capital. With all the hype one reads in the startup press these days, that fact can be easily lost. So we know that startups fail all the time, but why do they fail? Here are some common pitfalls based on our experiences (and here I’m referring not just to Foundry portfolio companies, although all of these lessons apply there as well, but also our observations of the broader markets). Premature scaling. The number one reason companies fail in my experience is premature scaling. 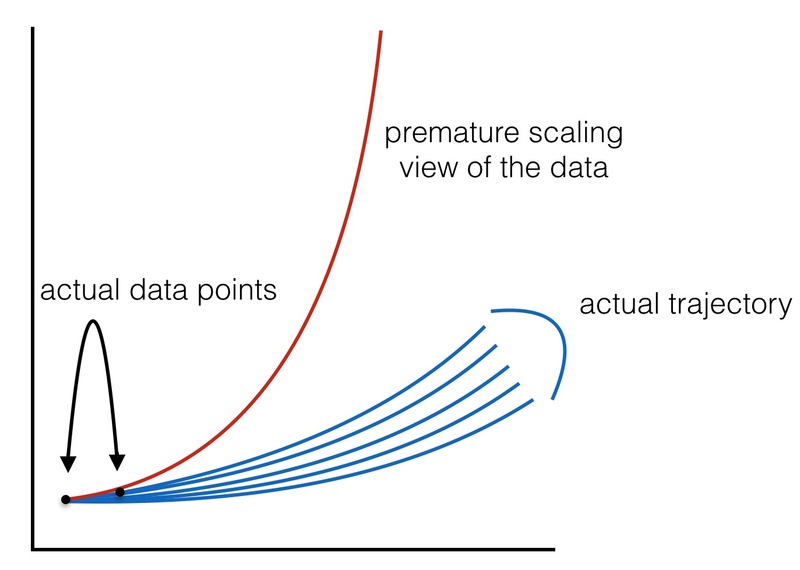 Companies that fall prey to this typically 1) believe they’re in a winner take all market; 2) are impatient to get to “scale” (for all sorts of reasons); and 3) extrapolate early data incorrectly (or just ignore it). Every time this happens to me I vow it won’t again. And inevitably it does. The most dangerous pitfall above is #3 (#s 1 and 2 are exacerbating factors that multiply the effect). A company gets some early data on sales performance and either completely misinterprets it or believes that early sales scales linearly (or even worse, on a log basis). Then rather than increment up and test your sales performance hypothesis you hire like crazy (see #’s 1 and 2 again) and all of a sudden your burn rate is out of control. Reading it here in black and white this is something I’d never do. Ever. But that’s not how it works and unfortunately it happens with way too much frequency. Typically in retrospect these kinds of mistakes are obvious, but when you’re in the middle of it everything seems nice and logical. An adjunct to this is believing that whatever problem you’re having in your sales and marketing funnel will somehow be fixed by scale/time (classic example is deciding that fixing your CAC payback period is a matter of spending more on marketing, vs spending some time honing in on what specifically is failing and what is working). Not recognizing that your sales problem is actually a product problem. This could be a blog post of its own, it’s so common and such an interesting topic. The typical response to lack of sales is to reexamine your sales and marketing organization. Perhaps you replace your VP of Sales ((hint: if you’re on your 3rd head of sales, you probably don’t have a sales problem) or perhaps you change marketing strategies over and over. Less frequently do companies look at their product and realize that their lack of sales isn’t at all related to their sales organization. Not taking money when it’s available. Perhaps with the markets changing more entrepreneurs will learn that raising capital is actually hard, but in the last cycle we commonly saw companies over optimize for founder dilution and under fund their businesses – presumably with the assumption that more cash would be easy to raise if needed. Sometimes that worked. But often it didn’t (because often the circumstances that make you need more cash are the same ones that make raising that cash difficult). Countless times I’ve watched companies make the mistake of trading a small amount of dilution today for the hope of more money tomorrow. The risk of taking a bit more capital now is a little less ownership. The risk of running out of capital is your company shutting down. You do the math. Lack of conviction. This is a dangerous one and often sneaks up on you – akin to watching a car crash in slow motion. As Gretzky once famously said, he skates to where the puck will be, not where it is now. To do that you have to have some idea of where the puck is headed. Some entrepreneurs get paralyzed by a fear of getting the market wrong that they sit back and wait for a sign of where they should go. This kind of passivity rarely works. I often tell CEOs that I’d rather us be wrong with convocation. Startups have limited resources and while getting feedback on what customers want or where a market is headed makes sense, at some point as a company you need to make a decision about where you’re headed and run hard there. Time doesn’t heal everything. This is related to lack of conviction, but occasionally I see companies who feel that their job is to maximize the runway they have left. And while making sure you have time to execute against a vision is important, doing so by treading water never works. This is most prevalent in companies that are shifting their focus or vision from an initial idea to something new. As part of that process they cut burn and somehow get attached to the 34 months of cash runway they have left at their low point, struggling to hire back up for fear of seeing that number jump down. But no company succeeds by treading water and ultimately these companies die a slow, but predictable, death. Careful introspection is important here. Typically it’s hard to admit when you’re in the thick of things that somehow you’re not a special case where the rules don’t apply (or put another way, it’s easy to squint at the data and suggest that you’re situation is different; it likely isn’t). And, of course, many times companies fail because they were just wrong about the market and the product they were trying to build. But understanding where companies typically fall short is a great way for you to lower your chances of falling prey to these common mistakes, and increase your chances of succeeding, even if your initial idea takes some iteration. My final thought is an obvious one, but companies fail because they run out of cash and aren’t able to raise more (or sell the business). Many of the ideas above relate to spending cash either too quickly or on the wrong things (or not raising enough capital when you can). There’s a saying in the advertising business that 50% of ad spend is wasted, you just don’t know which 50%. The same can often be said of startups. In every startup that I’ve been involved in that’s failed, I can look back and see dozens of places where we wasted money (always thinking to myself: “if I could only have that money back to spend knowing what I know now.”). Ultimately your job as a CEO (and my job as an investor and board member) is to help you make smart investment decisions so that you waste as little money as possible on your way to building a successful business.